The curved portion of high jump approach contributes to makes or misses before the jumper even leaves the ground. 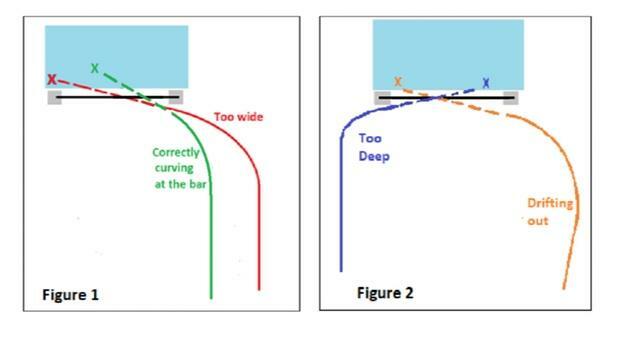 Many times bar clearance issues are a symptom of a poorly executed curve. A jump must not only be high enough, but far enough as well. A jumper must get from one side of the bar to the other -- they must penetrate. No matter how high one jumps, being too close on the way up or down increases the probability of knocking the bar off. The path of the curve affects these components. The HJ has a 2-part approach commonly referred to as an inverted "J". The first phase is a straight-ahead run that blends into a second phase, which is curved. The curved portion is initiated as a gentle bend more than a drastic change of direction. The path of the final steps will create a natural inward body lean from the ground -- much like a sprinter running the turn on a 200m track. At the plant, the take-off foot should be slightly pointing through the plane of the bar-never pointing away. The main issue with lack of penetration into the pit is running the last few steps of the approach in a direction that's nearly parallel to the crossbar. This is usually a product of the curve being too wide or too loose. 2. Going too deep. The straight part of the approach is too long and the curve starts too late. The approach ends up an inverted "L" shape (See figure 2). 3. Drifting out. Heading out wide and coming back across (See figure 2). In the examples above the last 2 or 3 steps will be nearly parallel to the HJ mat, and the resultant flight path will be down the length of the crossbar. Landing will be near the far standard with barely any penetration. At this type of trajectory even a light brush of the crossbar on the way down could cause it to roll off. Other risks are coming down hard on the bar, missing the far end of the pit entirely, or even crashing into the far standard. Generally speaking, if the approach is too wide it needs to be moved inward. Moving in will tighten the end of the turn a bit, create more lean, and provide a better angle of entry into the pit. A good rule is that for every 1 foot the jumper moves the starting mark in they must also move it back 3 feet. This allows the same amount of steps to fit in without stuttering or feeling crammed. The takeoff spot must be a little farther out once the angle of penetration is better. This puts the apex of the jump over the bar. Steeper penetration means passing over a shorter segment of the bar, easier rotation over the bar, and commonly ends in a backward roll after landing in the mat. Crossing over the top at a better angle results in a higher probably of brushing crossbars and having them stay on. Once a jumper leaves the ground they cannot change their trajectory, so the curve must send the jumper tangent into the pit, and far enough to get past the bar. Avoid extremes. The approach mark must also not be moved in excessively tight or else running the curve will become constricted.